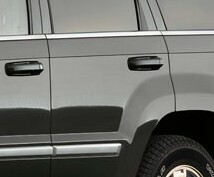 OEM WK Grand Cherokee door handles painted to match your factory color. Set of 4. Please provide VIN at checkout for verification. Please note: Single handles are available upon request.